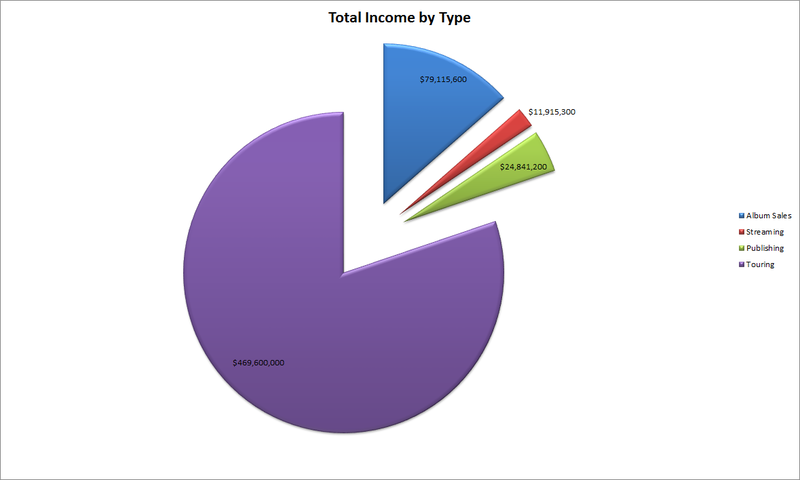 I’ve said it before and I’ll say it again: musicians earn the most income through touring. Earlier this month, Billboard released their list of the 40 highest-paid musicians in the American music industry from 2014. This list took into account album sales, streaming royalties, publishing royalties, and touring revenue (to understand Billboard’s methodology, see the asterisk at the end of this article). Topping the list was British boy band One Direction, whose annual revenue totaled $46 million. 1D was ranked #13 in last year’s list, having since skyrocketed to fame, fortune, and infidelity. The lowest earner in the top 40 was vintage rocker Tom Petty, whose greatest hits CD I was devastated to have lost in Germany in 2006, with a total earnings of just under $6.7 million. Perhaps Mr. Petty will see a fatter paycheck in 2015 after being awarded 12.5% writer’s credit for Sam Smith’s hit single “Stay With Me.” Taking into account all 40 artists, the average (mean) total revenue was approximately $14.7 million per artist. Looking at the chart below, you can see just who performed close to that average and who was well above or below. 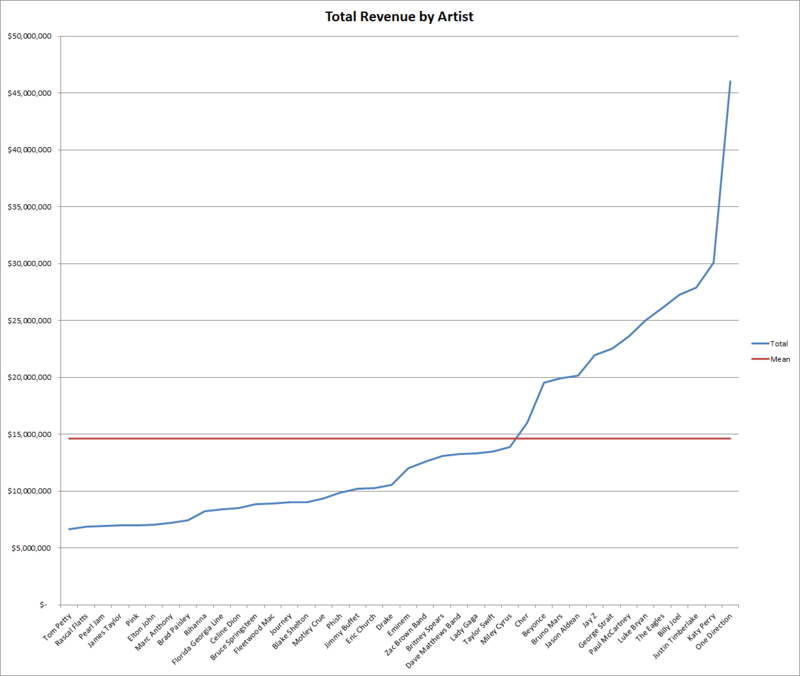 Total Revenue by Artist – Click for full size. Based on the above data, if you’re a white, female pop singer, you’ve got a good chance of earning about $15 million per year (see: Gaga, T-Swift, Hannah Montana and Cher). If you’re an old man pop/rock band, (see: Tom Petty, Pearl Jam, James Taylor and Elton John), you’d be lucky to break half of that. Fortunately for us, we can break down these data and truly determine where the most money is being earned, and who exactly is earning it. Out of the collective $586 million earned by these 40 acts within one year, 80% of it was earned through live performances and package tours. The average tour earning per act was around $11.7 million, with an outlier of T-Swift who for some reason earned a whopping $0 (which I find hard to believe). I am aware that this looks like Pac-Man eating slices of pizza and cheesecake. Just like our total annual revenues, pop music scored another win raking in a total of $156 million in touring revenue. Pop music accounted for about 28% of the artists on this list, which is no surprise given that the genre got its name from the word “popular.” What is surprising, at least to me however, is that #6 on our list of not only highest touring revenue but highest earners in general, is truck-drivin’, dip-spittin’, beer-chuggin’ bro-country/pop sensation Luke Bryan. Country has definitely made its mark in recent years, with its fun and relatable lyrics (not my words) and live performances which are akin to music festivals with their own unique culture. These live country ho-downs have drawn almost $104 million in touring revenues, putting country just behind rock and roll (which is still $20 million less lucrative than pop music). Touring Revenue by Genre – Click for full size. American music is dominated by mainstream caucasian artists, which is understandable considering 78% of the population identifies as white. Don’t be so quick to judge though, as historically black-dominated hip-hop and R&B accrued a total of over $72 million dollars, and latin music earned $27 million between just two performers on this list. 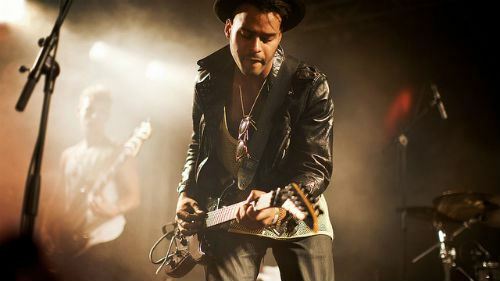 The Latino community is one of the fastest growing communities in the United States, and with stars like Bruno Mars on the rise, we can expect to see them make up a much larger demographic in American music throughout the next decade. One of the more technologically interesting aspects of this article is how much money was earned through streaming services. Companies like Spotify have been in the media recently due to their poor payment practices and royalty rates, with artists as high-profile as Taylor Swift proudly boycotting their business model. Ms. Swift earned just over $600,000 from streaming services before removing her catalogue late last year, due to Spotify not appropriately valuing her “art.” In her defense, however, T-Dog was the highest paid musician when it came to album sales, reaching almost $10 million in revenue. The least paid streaming artist was an old hippie group called Phish, whom most of you youngins have probably never heard of. Phish earned a grand total of $7,200 from streaming, likely due to their fan base being too high to understand how to properly use a computer. In all seriousness, we should be excited. People are buying music again, and the industry is on the mend. Remember when your only option was choosing between an expensive CD and iTunes download or pirating the album and risking your computer? I’m not saying that streaming is the best solution, for the artists or the fans, but at least it offers a better alternative for artists to get their music distributed. Streaming accounted for about $12 million in royalties between only 40 artists. That’s a lot of money once you think about it. If these guys can become millionaires writing the same recycled pop tunes, then maybe someday you can move out of your parent’s basement. Maybe. *BILLBOARD METHODOLOGY: Money Makers was compiled with Nielsen Music and Billboard Boxscore, 2014 U.S. data only. Revenue from merchandising, synchronization and sponsorship is not included. The following royalty rates, minus a 4 percent producer’s fee, were used: album and track sales, 22 percent of retail revenue; streaming revenue, 22 percent for current acts and 50 percent for heritage acts. Publishing royalties were estimated using statutory mechanical rates for album and track sales and the Copyright Royalty Board streaming formula; for labels’ direct deals with interactive services, blended audio and video rates of, respectively, $0.0075 and $0.0045. (A 10 percent manager’s fee was deducted from each category.) Touring revenue equals 34 percent of an act’s Boxscore.